Sun Wukong, (The Monkey King) is a monkey born from a heavenly stone who acquires supernatural powers. After rebelling against heaven and being imprisoned under a mountain for 500 years, he later accompanies the monk Xuanzang on a journey to India. Thus, according to legend, Buddhism is brought to ancient China. This much beloved story, is as much a part of Asian culture as The Iliad and The Odyssey or The Wizard of Oz are to the West. 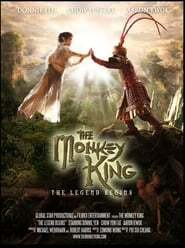 This first installment in a trilogy of live action 3-D movies is actually a prequel to The Journey To The West, the much told story of the Monkey King’s adventures on the road to India. The Founding of a Republic is a Chinese historical film commissioned by China’s film regulator and made by the state-owned China Film Group (CFG) to mark the 60th anniversary of the People’s Republic of China. The film retells the tale of the Communist ascendancy and triumph. The dynamic duo of Chon Wang and Roy O’Bannon return for another crazy adventure. This time, they’re in London to avenge the murder of Chon’s father, but end up on an even bigger case. Chon’s sister is there to do the same, but instead unearths a plot to kill the royal family. No one believes her, though, and it’s up to Chon and Roy (who has romance on his mind) to prove her right. Immortals Connor and Duncan Macleod join forces against a man from Connor’s distant past in the highlands of Scotland, Kell, an immensely powerful immortal who leads an army of equally powerful and deadly immortal swordsmen and assassins. No immortal alive has been able to defeat Kell yet, and neither Connor nor Duncan are skilled enough themselves to take him on and live. The two of them eventually come to one inevitable conclusion; one of them must die so that the combined power of both the Highlanders can bring down Kell for good. There can be only one… the question is, who will it be?